In a recent EMI blog post, we discussed ways that banks could re-engage with the small business market. One of these ways was to develop content of interest to small businesses. The development and distribution of targeted content can enable banks to re-establish credibility, act as a proof point of banks’ commitment to small businesses, and reposition banks as a key source of advice for small business owners. Conduct due diligence. Survey small businesses and company stakeholders to develop insights into what content topics small business owners are interested in, how they consume content, and how they perceive banks as content providers. In addition, banks should study competitors’ content development to identify best practices as well as approaches to avoid. And banks should also assess content topics and styles deployed by dedicated business media, such as Inc. and Entrepreneur. Develop a content portal. Large banks—such as Bank of America (Small Business Community), Capital One (Spark Business IQ), JPMorgan Chase (Chase for Business Resource Center), U.S. Bank (Connect), and Wells Fargo (Wells Fargo Works for Small Business)—have all developed small business portals. These portals publish a regular stream of small business-related content, which aim to drive small business awareness, interest and engagement. Establishing content templates and guidelines—covering content length, styles, colors, fonts, logo treatment, images and graphics, and approval processes—facilitate timely content development and publication. Focus on topics of interest to small businesses. Content developed for small business owners tends to be focused on key business life stages (e.g., starting a business, growing, selling), and related business challenges and financial needs. Such content positions the bank as a trusted advisor for small businesses at different stages of evolution, and can act as a catalyst for small business engagement. Utilize a range of content types. Banks have a range of different content types at their disposal, each of which offers specific advantages in terms of developing and presenting content. These include articles and blog posts, case studies and success stories, podcasts and webcasts, videos and infographics. Wells Fargo has a dedicated “Wells Fargo Stories” section on its website, which include thumbnail summaries, which link to additional detail, including video. Content should be presented in easy-to-consume formats for small business owners who are bombarded with information on a daily basis. Promote content across multiple channels. Banks should aim to present this content across a number of channels, including social media (in particular LinkedIn and Twitter), the company website, small business media, and small business-oriented events. In addition, this content should be adapted for use by the bank’s small business bankers in branches or on the road. Some banks that maintain small business content and advice portals extend this branding into social media. A standout example here is the @WellsFargoWorks Twitter handle, which mirrors the bank’s Wells Fargo Works for Small Business portal. Carry out small business surveys. Many of the large banks now conduct and publish regular (annual, quarterly or even monthly) surveys that track business sentiment and key challenges. These surveys help demonstrate the banks’ commitment to the small business market. And findings from the surveys provide fodder for content development that can be used across a range of channels. Many of these have been in place for more than a decade (PNC has published a semi-annual PNC Economic Outlook since 2003), and some include a metric that is tracked over time (e.g., the Bank of the West Small Business Growth Index). A number of banks create market-specific versions of these surveys (U.S. Bank publishes versions of its annual small business survey for 11 markets in its footprint), which help raise the bank’s profile in these markets. Banks have also conducted one-off surveys of current hot topics (e.g., the TD Bank EMV Survey in November 2015) or focused on targeted segments (the August 2016 Bank of America Women Business Owner Survey). Developing relevant and engaging content across multiple media enable banks to position themselves as aware of small business ambitions and needs, and committed to partnering with small business owners to develop pathways to business success. 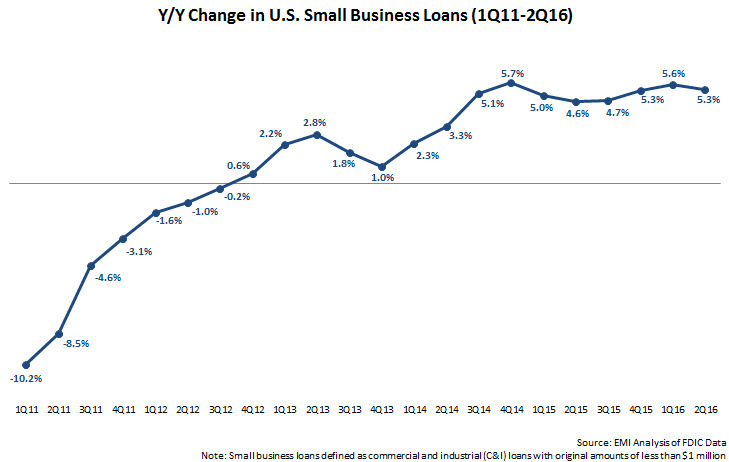 According to the FDIC, small business lending rose 5.3% between end-2Q15 and end-2Q16. Since falling to a post-Financial Crisis low of $279 billion in the third quarter of 2012, small business loans have risen 18%—to $328 billion—at the end of June 2016. Develop a small business brand. In recent years, several leading banks generated significant small business awareness by developing a dedicated small business brand. For some, these brands cover the bank’s entire small business operations. Capital One created the Spark Business brand for its small business solutions, and has launched a number of Spark-branded products and services, the most recent of which is the Spark 401(k) service. Another option is to develop a branded small business portal, and extend that branding into the bank’s small business social media presence. Wells Fargo created the Wells Fargo Works for Small Business portal, and applied this brand to social media platforms, including a dedicated blog and @WellsFargo Works Twitter handle. Target small business segments. Banks’ commercial banking units tend to target firms based on size and industry sector, as these are seen to have distinct financial needs. In targeting small businesses, banks are better served by focusing on small business life stages, or by targeting underserved segments, such as women-owned businesses. KeyBank has established Key4Women, a nationwide community of women in business. Create content of interest to small businesses. Banks can build trust and engagement with small businesses by developing and distributing information, news, and advice relevant to small business owners. This content should be focused on addressing common business challenges, and should ideally be brief and easy to scan (to reflect today’s content consumption patterns). Two recent good examples of small business-focused content are five tips from First Republic on how to run a better business, and tips from Capital One on buying or leasing office space. And banks should explore a range of content types, such as case studies, articles and blog posts, webinars, videos and succinct reports/white papers. Raise awareness through small business surveys. Many leading banks are conducting small business surveys, which aim to both raise awareness and promote their understanding of small business concerns and needs. Many of these surveys are carried out on a quarterly or annual basis, and feature recurring metrics (e.g., Wells Fargo/Gallup Small Business Index and Capital One’s Small Business Confidence Score). Banks also seek to tackle other small business-related topics either in these recurring surveys or in standalone surveys (examples of the latter include TD Bank’s Small Business EMV Survey and Bank of America’s Women Business Owners Spotlight). Market branch presence. Small businesses tend to have heavier branch usage than consumers, and banks can leverage this branch affinity by promoting small business solutions (including technology tools) in branches, deploying branch-based small business specialists, and hosting small business events. Promote small business-focused community groups or programs. In August 2016, Webster Bank announced a partnership with the University of Connecticut and Connecticut Innovations to establish a $1.5 million UConn Innovation Fund for new business startups. Before developing and implementing these small business initiatives, banks should conduct research to understand how and how well they are perceived by small business owners, and to identify deficiencies in their product and service capabilities relative to competitors. Banks should also gain insights from key internal stakeholders to assess its ability to address these issues using existing resources. These analyses support investment decision making, and inform small business banking program development and implementation.